This fall there are three heavyweights releasing books about easy artisan baking: Peter Reinhart is releasing his Artisan Breads Every Day, Jeff Hertzberg and Zoë François are following up their Artisan Bread in 5 Minutes a Day with Healthy Bread in Five Minutes a Day , and Jim Lahey's book My Bread has just come out. Jim is the founder of New York City's Sullivan Street Bakery and the inspiration for Mark Bittman's famous No-Knead Bread formula that ran in the New York Times three years ago. My Bread begins with the basic "bread in a pot" no-knead recipe but expands upon it considerably. He includes formulas (with both weights and measures) for rye, whole wheat, olive, walnut, and cheese variations of the no-knead bread. Lahey was inspired by Italian breads, so his book includes numerous pizza and focaccia recipes. Other interesting sounding recipes in the book include "Peanut Butter and Jelly Bread" and a Carrot Bread. There is a long chapter on sandwiches that include his recipes for fillings such as Rosemary Roast Beef, Citrus Roast Pork, and Marinated Eggplant and Beets. Soup and panini recipes are included in the book as well, giving you most everything you would need to run a top-notch neighborhood cafe. 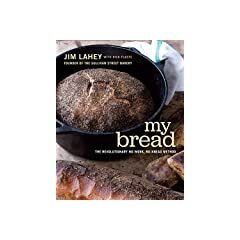 Fan of Sullivan Street Bakery or folks who love the "bread in a pot" no-knead technique will certainly enjoy Lahey's book. My Bread has much to offer other bakers too and sets a high bar for the other upcoming releases. Floyd - these look great! I will have to get another bookshelf! Are these all sourdough recipes? This winter I plan on spending some serious time playing with recipes and trying sourdough. I have a whole library of books on bread baking and once the market settles down I will have some time to experiment. I just lent My Breads out to someone, so I don't have it in front of me, but I don't recall seeing any sourdough recipes. The top review of it on Amazon also says "sadly, no sourdough recipes," so I'm pretty sure that is the case. Instead the recipes use low yeast, slow rises, and long fermentation to get maximum flavor. Would you not just replace the yeast with 1/4 cup sourdough? This is the shown at the BreadTopia site using the no-knead bread recipe. Well I don't necesarily disagree with you bnom, but the "easy, no knead" marketing worked on me and got me making my own bread. I have wanted to bake my own bread for years, but every time I tried I got bogged down with the glossary of terms, formulas and techniques. Now that the no knead bread has worked for me and I have tasted the difference over supermarket stuff they call bread, I am inspired to apply myself to learning all I can about the long, slow, loving way. I view books like this as a valuable stepping stone into the breadmaking world. We need to make our world inviting and rewarding to as many as possible; that way, more people would begin to enjoy the pleasure of baking and eating a fresh, handmade loaf.